THE EPO has become even worse than the USPTO when it comes to granting abstract patents. At the USPTO there are at least examiners who bring up § 101 and reject applications based on it. Not at the EPO. The 4th Industrial Revolution continues to gather momentum, and the digital transformation is affecting all aspects of life, as shown by the EPO’s report on “Patents and the Fourth Industrial Revolution”. Information and Communication Technologies (ICT) are converging with all traditional areas of technology. This provides opportunities for emerging technologies such as Artificial Intelligence, capable of “Machine Learning” and optimising systems too complex for manually programmed algorithms; and Blockchain, for digital-speed processing of secure transactions. There has been a lot of rubbish like this lately — so much that European law firms exploited the opportunity to promote themselves by googlebombing “AI” in relation to the EPO. They want applicants to come to them. Just before the weekend Frances Wilding and James Ward (Haseltine Lake LLP, which has been reposting stuff quite a lot lately) wrote about the EPO further cheapening patents and/or tossing out patent quality. Everything is in the mix: “CII”, “4IR”, not to mention the above (“blockchain” and “AI”). CII generally involve software developments and can relate to almost any field of technology. 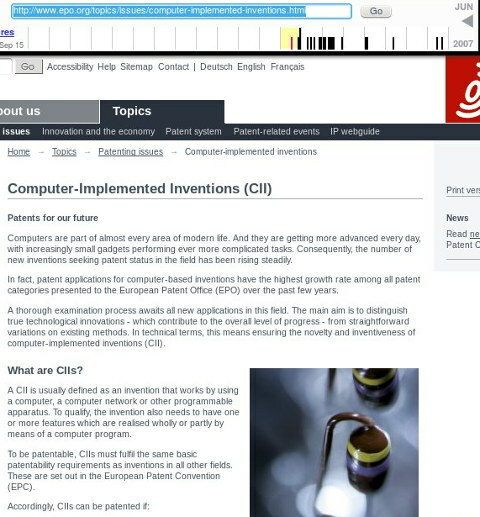 An EPO report (“Patents and the Fourth Industrial Revolution, The inventions behind digital transformation” December 2017) recognizes that “innovation in the enhancement of products and processes is increasingly taking place in the virtual layer of software, rather than in any hardware components.” and “A large proportion of current inventions are therefore based on software implementation.” How the EPO deals with CII is probably of greater importance now than at any earlier time. Issues pertaining to these “non-technical” subject-matters arise not infrequently in relation to CII. The aim for EPO examiners and applicants is to assess and ensure that a claimed CII does not fall on the “non-technical” (and hence inherently unpatentable) side of the line but falls on the “technical” (and hence potentially patentable) side of the line. The relevant EPO policies and practices for distinguishing between “non-technical” and “technical” have evolved over many years. Briefly, to fall on the “technical” side of the line, the claimed invention should find application in a field of technology and involve some aspect of “technicality” – technical character, technical contribution, or technical purpose.